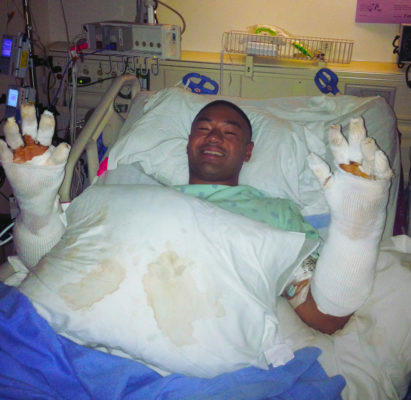 The true story of one Sacramento Firefighter’s sacrifice and his road to recovery. Upon entering his first house fire, the entryway floor collapsed beneath the weight of firefighter Alex Galang. The fall of over seven feet sent him to his back on the dark basement floor below. Recognizing how deadly a situation he was in, Alex knew he had to act fast. Reaching for the floor joists, he attempted to climb to safety on his own. In the struggle, he lost both gloves, while his hands, arms, head, and calves started to burn. As his life flashed before his eyes, he kept focused on one thing: getting back to his wife, Tina. Another firefighter fell into the basement soon after. After calling a mayday out over the radio, Alex crouched down to boost his friend to safety. The pain from the burns was excruciating as I stood in that hot basement, recalls Alex. But Alex’s ordeal didn’t end here. First, the rescue ladder lost its footing, crashing Alex to the floor yet again. Next, the unintended blast of a firehose struck him in the head. Devastated, tired, in pain, and out of breath, his oxygen mask was now filling with water. Support crews moved quickly, as a second ladder arrived alongside shouts of encouragement. With only 90 seconds of air in his respirator left to breathe, the crew above pulled Alex free. The injured firefighter was immediately taken to UC Davis Medical Center. Alex suffered second and third degree burns to his head, hands, arms and legs. A three-week stay in the Firefighters Burn Institute Regional Burn Center was necessary. 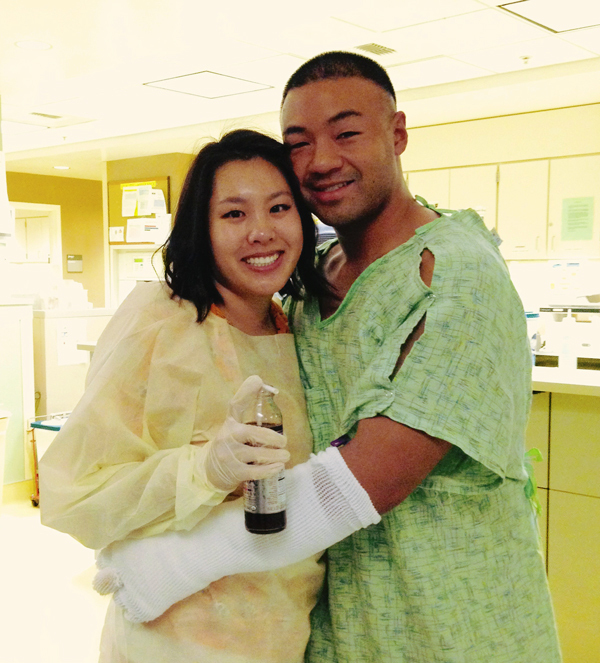 His care program ranged from skin grafts to rehabilitative therapies and emotional care. 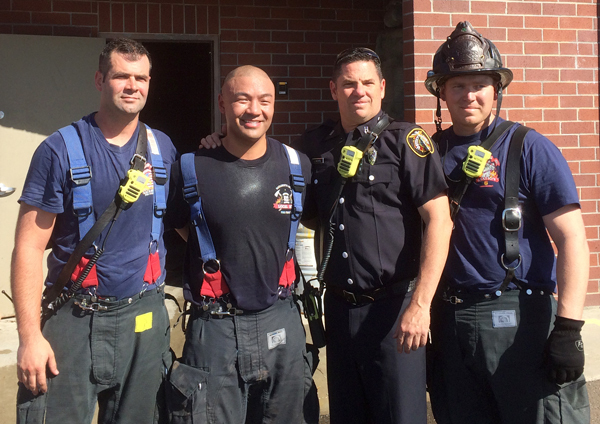 Alex attributes his recovery to the hard work and compassion of (those) at the Burn Center, the Firefighters Burn Institute, and Sacramento City Fire Department. From the hospital stay, to the emotional support, I felt my injuries were completely taken care of. Alex notes that the encouragement of and connection with the burn community played a vital role in his recovery. The Firefighters Burn Institute is excited to share stories like Alex’s, which go to show just what the support of the community has allowed us to do for over 40 years. In 2016 alone, the The Firefighters Burn Institute Response Team responded to the burn unit 11 times, admitting firefighters from all over the Western United States. Now back to full duty as a Firefighter/Paramedic with the Sacramento Fire Department, Alex continues to push himself to grow. In many ways, he finds, my mental health recovery is far more complex than my physical burns. Managing anxiety and symptoms of my PTSD will always be a part of my life. The community continues to help Alex learn to live with this new ‘normal.’ Recently attending the Phoenix Society’s World Burn Congress was an important step. There, he met many inspiring burn survivors, and shared his own first-hand experience to inspire others. All in all, the FFBI played a huge role in my recovery and continues to support me in my journey as a burn survivor. I am forever thankful for the FFBI! There are many different ways to get involved and help the Firefighters Burn Institute! If you would like to help out and get more involved please contact us, we would love to hear from you!